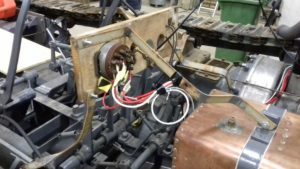 We discovered that the steering gear did not work correctly when we turned to the right. 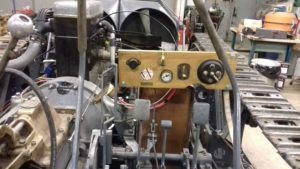 Now the problem has been fixed, but it took some time and a lot of thought was needed to determine what the error was, but also to understand how the steering gear actually works. 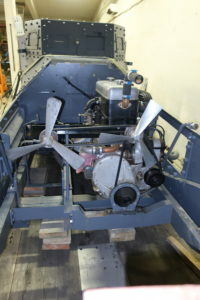 The engine frame is mounted in place in the body. 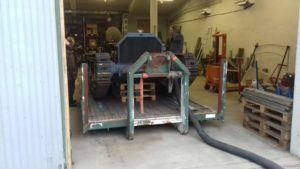 The steering gear is checked and adjusted after the test runs and as soon as all parts are mounted we lift the steering gear onto the underbody. 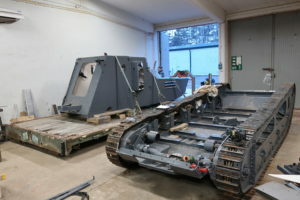 Finally it is time to assemble the body and the underbody to a unit. 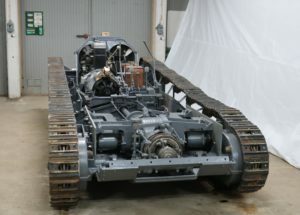 The body and the engine frame are now assembled to a unit, but some bolt connections are missing before the body can be lifted onto the underbody. 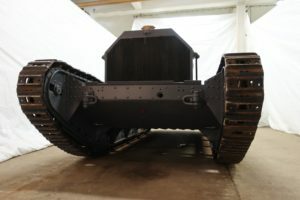 But before that, the underbody must be cleaned and rustproofed. 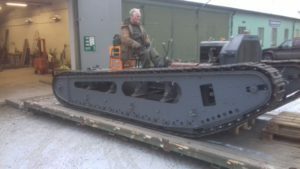 Body and engine frame joined. 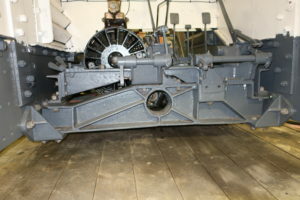 The body and the underbody stand next to each other again. 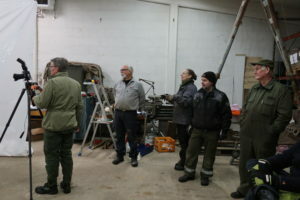 The power line is tested and it works properly. 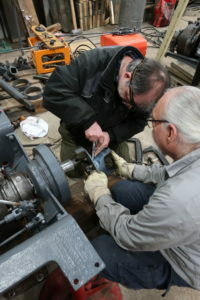 The next step is to mount the body on the base, but there are some preparations that must be made first. 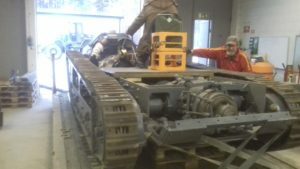 With the help of a wheel loader, the engine frame with the engine and the gearbox is taken away. 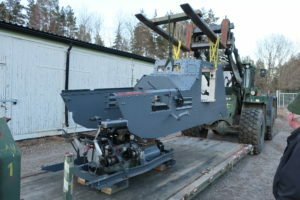 The body and the engine frame must be assembled to a unit before the body is mounted on the base. 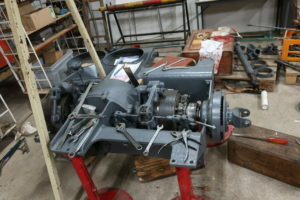 We have made a photo documentation of the driveline. 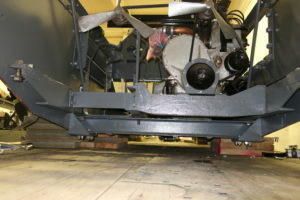 When the body is lifted and the floorboards are in place it is impossible to see how the driveline is designed. 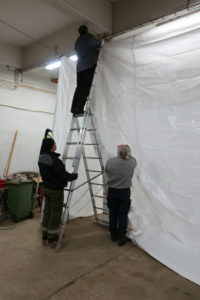 To get better light for the photography, we hung up a number of bright tarpaulins around the wagon. A small glimpse on the results. 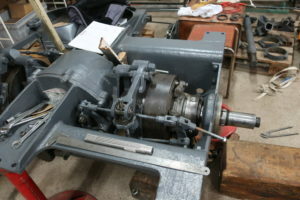 Finally we have got a run on the steering gear. 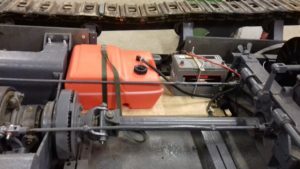 We have run a number of times and the total mileage is between 500 and 600 m. The steering is a type of clutch/brake and it has taken time to adjust, because just as the clutch begins to release, the brake must be applied. 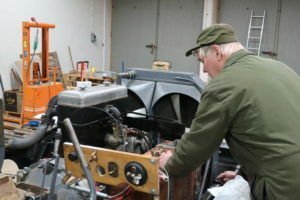 Therefore, a lot of time and many practical tests have been required before the steering gear was properly adjusted. In the movie below we see one of the first test runs. At the first test run we did not have all the controls connected. We had to drive at constant engine speed. 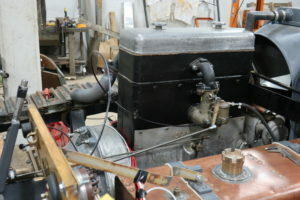 Now we have connected the throttle linkage, choke and ignition adjustment so at the next test run we have significantly better opportunities to perform a controlled test of all functions.